Our trade and transportation department is a fun place to be if you enjoy correlating data among your friends here to gain the best credit making routes for your precious cargos; to show off your massive hauling capabilities, or to push our logistical performance into excellence via contracts you or we may have with outside parties. Brigade's access to The Database, a place for finding information on all businesses in the Star Citizen universe, gives you an extensive list of businesses, organizations and players, with reliability ratings and reviews on each of them. If you are intending on running a business, then you can register yourself to the Trusted List, gaining a sizable promotion, and know that you can quickly suss the strength of a deal through the Business Registry, which has black and white lists. 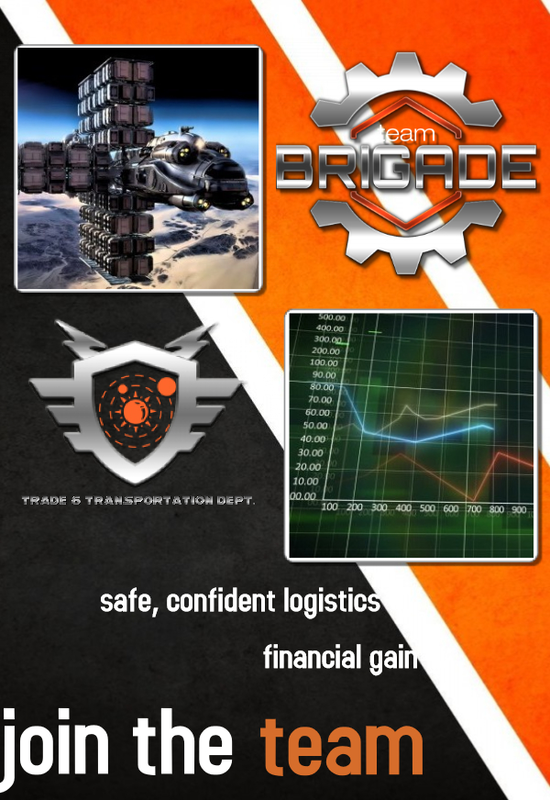 Brigade offers a very helpful environment in which we know how much we can prosper as a team looking out for each other's best interests in the area of financial gains and safe, secure, confident transportation.